We are making our shiitake kits with a new strain of shiitake. It is more productive and reliable than older strains we used in the pass. You should notice the difference in the color, taste and productivity. You should start this kit in a timely manor for long delays may result in the shiitakes fruiting inside the box before it is opened. Shiitake mushrooms are one of the tastiest mushrooms grown. It has a wonderful earthy flavor, which is why it is desired as an expensive good edible. Grows approximately 2 pounds of shiitakes over a 4 month period of time. 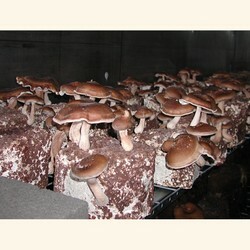 Keep the shiitake block moist to maximize production. For further descriptions and information see pricing and outer box options below. Shipping charges are calculated at time of check out. Shiitake mushrooms are one of the tastiest mushrooms grown. It has a wonderful earthy flavor, which is why it is desired as a good edible. Our mushrooms are grown on a compressed sawdust block, which allows us to make the blocks uniform in size and easy to handle. They tend to fruit best during the cooler time of the growing season. They do well at temperatures between 55 to 70 degrees F. The best fruiting temperature range is usually between 60 to 65 degrees F. Mushrooms vary in size from large to small during the fruiting cycle. The largest mushrooms are usually grown during the first or second crop. Smaller mushrooms grow later as the mushroom block loose nutrients. The block can grow up to 4 or 5 crops of mushrooms, but usually 2-3 crops are normal. Our kits are ready to grow upon arrival and should be started in a timely fashion, within 2 weeks of arrival. If they are not started right away they may attempt to fruit inside of the box, before it is opened. To prevent this refrigerating them below 45 degrees this will usually stop them from fruiting, but do not freeze the block. All mushroom kits can to some degree attract small fungus gnats this is normal. Shipping charges are calculated at time of check out. Contains: One sawdust block inoculated with shiitake mycelium. Fruiting Time: 4 to 6 months. Mushrooms grow at 30 to 45 days cycles. Mini Kit Shipping Weight: 7lbs. / Grows up to 2 lbs of mushrooms total.